To have the best time when golfing, you need to ensure that you have the right gear and equipment. 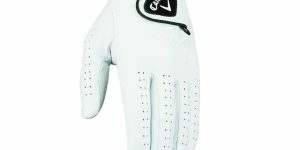 We are going to introduce you to the, Top 10 Best Golf Gloves in 2019. When wearing the best golf gloves, you will definitely note an improvement in your game. Some people tend to underestimate the value that golf gloves have. They have more benefits than they are given credit for. Golf gloves protect our hands from blisters and prevent calluses from eventually developing on your hands. Playing golf for a continuous amount of time will expose your hands to the wear and tear associated with the game. That is why we should ensure that our hands are covered, to ensure that they stay soft. These are just but a few examples, of the benefits golf gloves have. You will be comfortable all through the game and warmer during the cold seasons. The Size of the Gloves: Before buying any gloves, check the sizes that the gloves are available in. This way, you will reduce the chances of buying the wrong size. A glove that’s too big will keep falling off, while a smaller one will cause you discomfort. You can only play your best when you use the correct fitting gloves. Comfort: You can’t overlook this feature. One of the main reasons people wear gloves is to be comfortable when handling clubs. That is why you should analyze how the gloves feel in your hands. You should not overlook the material used to make them as well. 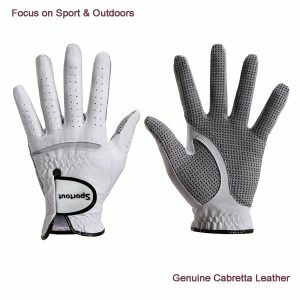 Breath-ability: The best golf gloves have been designed with various ways of moisture management. Some have absorbent material, while others even have perforations to cater for that. When your hands retain their dryness, you’ll be more comfortable. As a result, you will be able to maintain your performance all through the game. 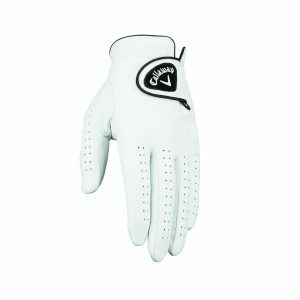 Price: Golf gloves are available in different prices. You should do proper research, regarding the quality available within your budget. Make sure that you don’t settle for something lower in quality, just to save some cash. Such gloves don’t do much for one’s golfing experience. 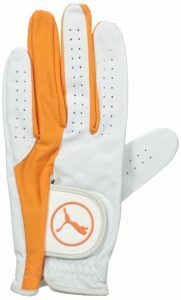 Puma offers you a left hand side golf glove. It has been made with Cabretta leather which is super soft. Breathable gloves are something every golfer should have. These particular gloves have perforated fingers for that purpose. The fingers are also made with Lycra and have double lining. The closure is made from a Velcro tab and has a PUMA cat drawn on it. The overall makeup of the gloves is 23% Lycra and 77% Leather. These are the exact kind of gloves you need when you intend to play for long hours. The golf gloves are also available in two other colors. This specific one comes in orange, but you can also get it in black and Monaco blue. If you want the best golf gloves, made by the best, then this would be a good fit for you. These gloves were designed by an orthopedic hand surgeon. It even has an anatomical pad system which has been patented. They were made for golfers, who want to have a boost in their swinging speed and distance. The gloves are able to do that, since they also have a lighter grip. The gloves have the capability to imitate the flexing motion of the hand. This is thanks to the glove’s elongated 3-D flexion zones. They enable them to stretch freely around the finger and the palm, where natural creases occur. The comfort you’ll get is way more advanced, and the club will feel better on your hands. Your purchase will get you a complete set of golf gloves. This value pack is highly rated and will satisfy your golf needs. They will fit you comfortably, thanks to the FiberSof incorporated in the glove’s palm and back. These gloves were designed with dual PowerNet mesh insert. The inserts are responsible for making the gloves more breathable. Everything about these gloves is top notch. From the wrist elastic, down to the 3-Directional tab closure. It is not surprising that Premium Cabretta leather was used on the glove’s thumb and palm patches. Thanks to Callaway, you no longer have to worry about cold or wet seasons. 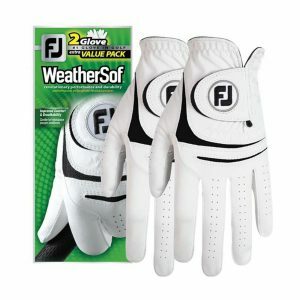 This golf gloves ensure that you can still play golf, regardless of the weather condition. To improve your grip when it’s wet, the palm of the gloves has digitized Synthetic Leather. They were designed to repel water, thanks to the Opti Shield Microfiber Outer Shell. This will also benefit you, when the conditions are windy. Their inner lining has Opti Therm, Thermal Fleece. This is what helps keep the player’s hands warm. You will love how secure the fit is. The gloves have an adjustable closure, which lets you get the right kind of fit for you. 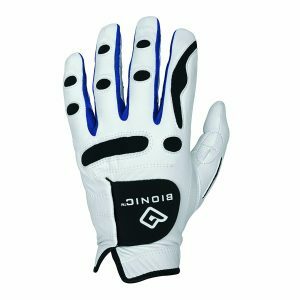 The Time Bus golf glove is available in numerous sizes. Its palm and fingers have perforations to ensure it is breathable. 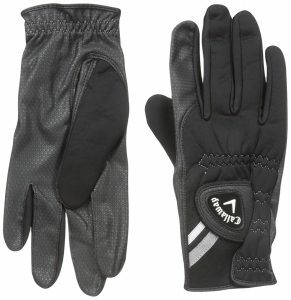 The glove has great moisture reduction performance and great for use in any weather. To add on to that, the mesh Lycra stitch design incorporated in the gloves, provide enhanced breathability. A combination of the stitching with the cotton terry cuff is used throughout the palm, the back of the hand, and the fingers. This is why most users would describe the glove, as a super comfortable option. The gloves are light, but they are very durable and great fitting as well. Your purchase will also get you, 100% Money Back Guarantee. 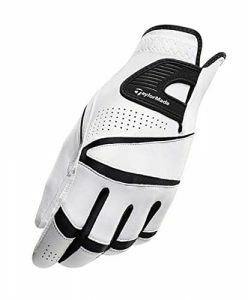 Ergonomic golf gloves are a must have for any serious golfer. This particular glove has an ergonomic pull tab, to serve that purpose. The Taylor Made glove was constructed using full premium leather. It is breathable because it has engineered perforation. This ensures that you will have a comfortable experience while playing. You don’t have to worry about the glove fitting you. Stretch Lycra panels were used, to provide the user with a precise fit. 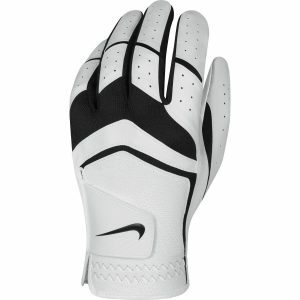 Nike has the ideal glove for golfers who are right handed. This glove was made using; 5% goatskin leather, 10% nylon and 85% polyurethane. 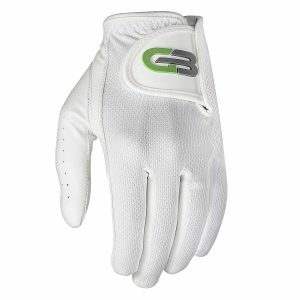 Its ergonomic fit is superior to most golf gloves in the market. This is because its tab closure is angled and can be adjusted as well. You will also notice that, it offers a better motion range compared to other gloves. The gloves are well balanced, in terms of durability and feel as well. This is as a result of the leather used on its palm and thumb. This glove is exceptional, such that it will like your second skin. It wasn’t given its name without any reason. The grip offered by the glove is enhanced, thanks to the highest quality cabretta leather used. Regardless of the weather, these gloves will provide you with a worry free game. Moisture is driven out using mesh backing, and it even has perforations for the same. Your hand will retain its dryness throughout. Some even refer to this glove, as being the coziest in the market. What if you had the chance to prevent fatigue while you played golf? 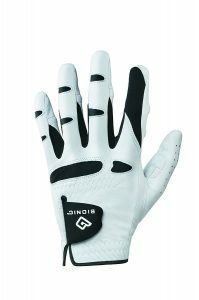 This is what this Bionic golf glove offers you. It was designed with a patented anatomical pad relief system, which makes this possible. The system also increases your grip, by evening out your hand’s surface. This leads to the grip pressure on your hand, being displaced uniformly on the club. In places where other gloves commonly break down, this premium glove offers double the strength. The glove also has a pre-rotated finger design. Because of this, it’s capable of following your hand’s natural curvature. This makes it feel like a second skin. I would recommend this for individuals, who prefer all-leather constructions. You are guaranteed that this glove will provide you long term service. Cotton Terry Cuff was also used to ensure that the glove has a soft feel to it. As far as ventilation and moisture absorption are concerned, you won’t have anything to worry about. The gloves have a great fit and are quite secure. We have come to the end of our top 10 best golf gloves review list. After going through this list, you have probably realized that some gloves are limited to one hand. Make sure you confirm that you are buying the correct hand side. However, some of them are ambidextrous as well, while others are sold in packs of two.